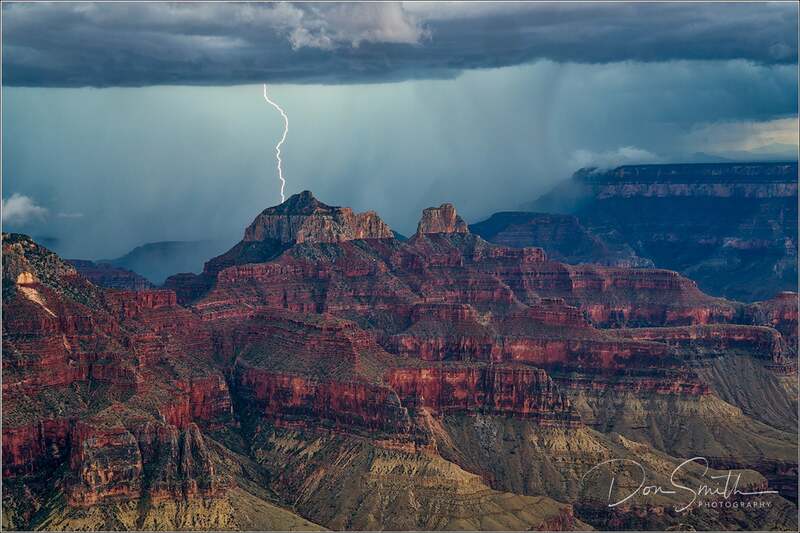 Sony Artisan Don Smith recently headed out with fellow Sony Artisan Gary Hart to the Grand Canyon to capture a unique phenomenon - daytime lightning. Smith credits a National Geographic article featuring the weather wonder as part of a story on Arizona's monsoon season nearly ten years ago with peaking his interest in the subject. Now Smith says he considers himself "amateur storm chaser" and thus ventured out with Hart to see this monsoon highlight for themselves. When it came to gear, both artisans were armed with their Sony α7R II's, Sony α6300's, as well as their clutch lens choice for the occasion, the Sony FE 24-70mm f/2.8 G Master. Smith insists that these two cameras were perfectly suited for shooting the daytime lightning saying, "they are by far the two best cameras one can use because of their amazingly-fast shutter lag times." He goes on to note precisely both camera's shared shutter-lag time. "The α7R II's shutter-lag time is a scant .020 second ... The Sony α6300 with its APS-C sensor is also rated at .020 second. This incredibly short shutter-lag time makes both cameras the best at capturing daytime lightning! Although a thrilling chase with undoubtedly stunning rewards, Smith acknowledges the risk involved with such an adventurous pursuit in dangerous weather. "Lightning can jump on average 10 miles between strikes. We knew if we were close enough to hear thunder, we were close enough to be hit." However, he explains for a shot of something so spectacular that only occurs in these precarious conditions, that's the wager one makes. "Yes, we were putting ourselves in harm’s way; yet, there was really no other way to compose these scenes without being out in the middle of it all. We also knew all the stats: roughly 87 people are killed each year by lightning strikes (10% of all those hit). The other 90% have various types of injuries that can last the remainder of their lives." See Don Smith's full article on shooting daytime lightning at donsmithblog.com. Learn more about Sony Artisan of Imagery Don Smith here.